The Americans with disabilities act protects individuals with a disability,who are qualified, from being discriminated against by employment agencies, government, private employers, and labor unions. A qualified individual with a disability is able to perform task in a work environment with or without accommodations. Reasonable accommodations made for an employee with a disability includes making a place of business accessible for the person to use. This also involves making certain adjustments to the schedule. Modifications to equipment, devices and examinations are included. Policies, trainings and interpreters are also part of the modifications. Modifications in a facility includes proper sign usage for a person with a disability. There are certain requirements that ADA signs must meet. Some of these requirements include typography, tactile typography, locations, and mounting heights. When it comes to the typography on the signs, ADA requires that an acceptable font to be used on all upper case and the font should be raised at least at 1/32". The tactile characters must be san serif. You are not able to make the font italic, oblique, or over decorate it. It is important that the character proportion of the width of the "I" be at 15 percent of the letter height. The width of the "O" should be anywhere from 55 and 110 percent of the height of the upper case "I". You may also want to know that the copy height of the tactile information be at a limit of 5/8 inch and 2 inch. Also the tactile spacing be at a minimum of 1/8 inch and the maximum amount allowed is four times the stroke width. Spacing between the lines of copy have to be at a minimum of 135 percent and the maximum is at 170 percent of the "I". Braille should be placed underneath the characters. The shape of the braille must be rounded. The grade 2 braille must meet dimension and capitalization ADA standard requirements for accessible design. Some of the tactile typography fonts allowed are Arial, BAV Garde_Normal, Frutiger_Normal, Futura Book, Heletica Neue_Roman, and Myraid Pro(MP). The permanent locations of ID signs should be located at the doorways. Only if there is no room can a sign be placed at the nearest adjacent wall. Signs on double doors have a couple of ways that it can be mounted. One way is that the sign be placed on the door that is not being used. If both doors are being used then the sign should be placed on the right to the door at the right. If the right hand side is occupied with other items, then the nearest adjacent wall will do. Signs are to be mounted at a 48 inches to 60 inches above the ground. Symbols for visual information is also an ADA requirement. The symbol should be located within 6 inches of a vertical void and the background should contain a non-glare finish. Braille and characters cannot occupy the same space as the pictograph. Color should contrast with the raised characters to make it legible for individuals with low vision. It is recommended that international symbols are used. For example the famous wheel chair accessibility symbol. Rest room signs must have a 1/2 inch foam tape. 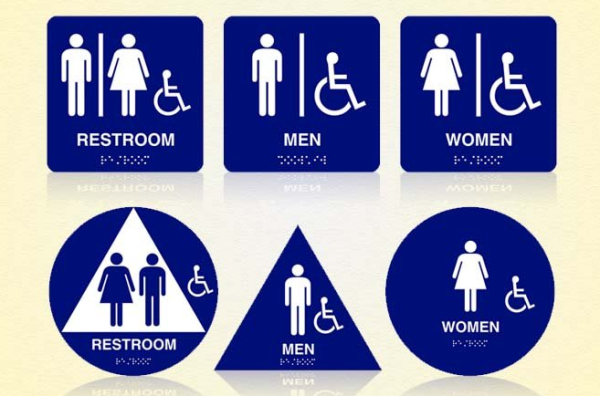 This is to separate the pictogram from the font and on a unisex to separate the male and female symbol. A reflective handicap sign for a parking space must be placed 60 inches above the ground, which is measured from the ground up. It is important to meet and be compliant with the ADA standard requirements. If you have any questions or need further information, please feel free to call us at The Sign Studio (818) 843-9200 or send us an e-mail at info@signstudiola.com.